The perfect Yoga Bag to inject some vibrant colour into your Yoga life! The FlowerLee collection of BLooM Yoga Bags consists of brightly coloured bags of water resistant material. A very practical bag for yogis. 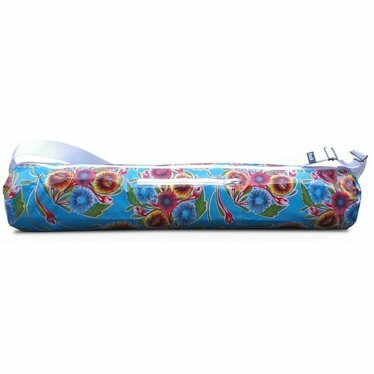 The FlowerLee collection of BLooM Yoga Bags consists of brightly coloured bags of water resistant material. A very practical bag for yogis, with the convenient adjustable strap you can easily carry your yoga mat anywhere. The yoga mat bag has a pocket for your cell phone or keys and is spacious enough for a yoga mat, light clothing and a bottle of water. The long zipper, about the length of the bag, makes it easy to get your yoga mat in and out of the bag. Enjoy this unique colorful bag! These Bloom yoga bags from the Flower Lee collection is only available in one colour. Size: Length ca. 70 cm and diameter ca. 14 cm. Material: water resistant from cheerful coated canvas with adjustable strap.